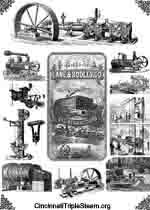 Steam powered machinery expands into many common areas and we have included publications and information by steam authors from the Greater Cincinnati area and beyond. 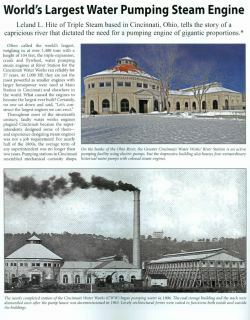 Authors along with the editors for Engineers & Engines Magazine, Steam Traction Magazine, Old Glory Magazine and the Journal of Kentucky Studies have graciously provided permission for reprint on CincinnatiTripleSteam.org. 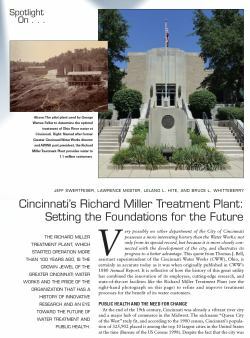 Leland L. Hite of Cincinnati Triple Steam based in Cincinnati, Ohio, tells the story of a capricious river that dictated the need for a pumping engine of gigantic proportions. Engineers & Engines Magazine. 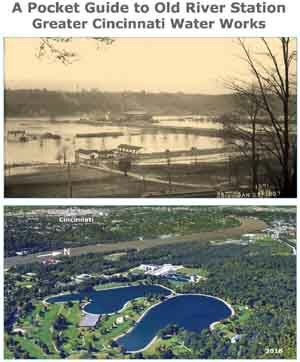 From the organization Cincinnati Triple Steam based in Cincinnati, Ohio, Leland L. Hite tells of the extreme difficulties associated with the installation for a system of steam-powered pumping engines of gigantic proportions on a capricious river that dictated its need. British version published in the Old Glory Magazine. Docent for Cincinnati Triple Steam, Leland L. Hite, describes amazing details regarding four of the world's largest steam engines. 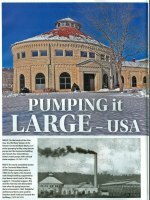 In addition, learn how the pump house was built at ground level and lowered by sand hogs. A chronological history for the R. D. Wood & Company by tour guest Paul M. McConnell. R.D. 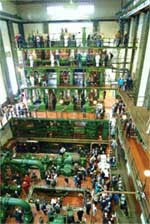 Wood & Co. was the builder of four the world's largest crank and flywheel water pumping steam engines housed at Old River Station, Greater Cincinnati Water Works. 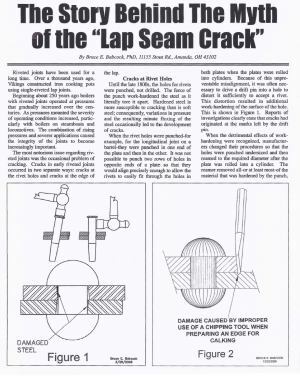 The Story Behind The Myth of the "Lap Seam Crack"
A listing of over 27 Big Iron Museums in the USA that provide public tours for either walk-in or pre-scheduled tour guest. 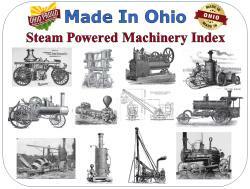 A linked Index, alphabetical and by city, for manufactures of steam engines and steam powered machinery made in Ohio. of a large stationary steam engine. "Restoring a superseded large stationary steam engine to an operational condition for educational and entertainment reasons is an attractive proposition to many, including professional engineers. Yet there are many problems in adapting such machines to work under off-design conditions in the context of a voluntary group in the culture of 21st century safety and responsibility. This paper discusses the experience gained over thirty five years at three such museums in London. In particular, the need for careful appraisal of how the engine will behave in its new role, the requirement to carry out the work within conservation guidelines, and the problems of maintaining and operating the engine after restoration is complete are reviewed." 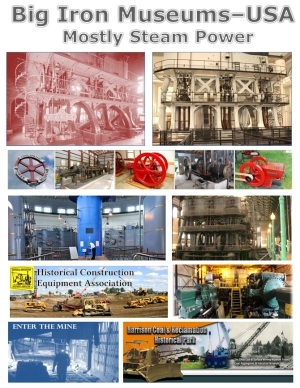 Very possibly no other department of the City of Cincinnati possesses a more interesting history than the Water Works: not only from its special record, but because it is more closely connected with the development of the city, and illustrates its progress to a better advantage. Originally published in Steam Traction, May, 2006. "There were three firms which could be considered major agricultural manufacturers for their day: Miles Greenwood’s Eagle Iron Works, Blymyer Manufacturing Co., and Lane and Bodley Co. Both Eagle Iron Works and Blymyer Manufacturing were sold and renamed several times, eventually either going out of business or completely losing their identity. 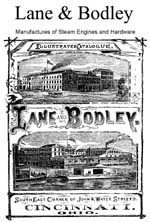 Lane and Bodley was the longest survivor of these early firms, always retaining its original name and a measure of family ownership and remaining in business until 1920." "Alexander B. Latta is given credit for the first workable steam fire engine produced in 1853 for the city of Cincinnati." "Part love story, part drama, part success story, part history, part tragedy, this is the story of innovation of a new form of transportation on western rivers. It is not at all a bad story. Keep in mind that most of us if not all of us reach the heights of our endeavors by standing on the shoulders of those who went before." Firefighting Murals at the former communications headquarters for the Cincinnati Fire Dept. Twenty two foot steamer (MISS BLUE) was built in Clayton, New York in 1910 and rebuilt by Harry Card in 2004. At about 400 RPM. the steamer travels at 5-6 m.p.h. Seats 5 to 6. She will cruise at 60-90 p.s.i.g. with a max of 150 p.s.i.g. Piloted from the front or the engineers station Steamboat (MISSIE) piloted only from the rear and uses a home-built, fore-and-aft compound, condensing engine, with a propane-fired water-tube boiler. MISS BLUE seats five to six, can be piloted from the front (usually by his wife) or from the engineer’s station behind the boiler (two wheels). She will cruise at 60-90 p.s.i.g., 120 p.s.i.g. max at about 400 RPM and 5-6 m.p.h. A home-built, simple engine, single cylinder and a wood-fired water-tube boiler. The Island Queen (925-1947, by Cincinnati artist and model builder Mr. John I. Fryant As a child, Mr. Schiffer would ride the Island Queen Steamboat, and referred to it as the CONEY ISLAND BOAT, while the crew called her BIG LIZ..
Mr. Thomas D. Schiffer, is owner of the only two operating steamboats in the Greater Cincinnati area. Mr. Schiffer is also the author for the history of the Frisbie Engine & Machine Co. in Cincinnati (steam engines), and author for the history of the Peters & King Cartridge & Gunpowder Manufacturing Companies located where Kings Island is now. 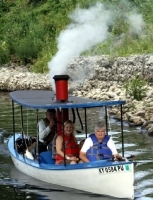 The 22 foot long steamer (MISS BLUE) with the canopy was built in Clayton, New York in 1910 and rebuilt by Harry Card in 2004. It has a home-built, simple engine, single cylinder and a wood-fired water-tube boiler. She will cruise at 60-90 p.s.i.g. with a max of 150 p.s.i.g. The boat has a three bladed Monel propeller with an 18” diameter and a 23” pitch. At about 400 R.P.M. the steamer travels at 5-6 m.p.h. MISS BLUE seats five to six, can be piloted from the front (usually by his wife) or from the engineer’s station behind the boiler (two wheels). 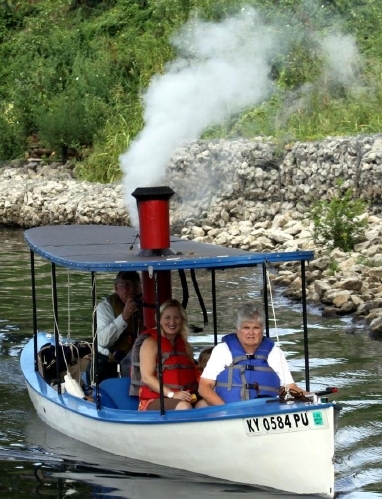 The second steamboat (MISSIE) can only be piloted from the rear and uses a home-built, fore-and-aft compound, condensing engine, with a propane-fired water-tube boiler. She will cruise at 60-90 p.s.i.g. with a max of 120 p.s.i.g. The keel condenser will typically run about -10 p.s.i.g. She is built on a twenty-foot fiberglass Rose hull equipped with a three bladed bronze propeller, 18” diameter and a 23” pitch. At about 400 R.P.M. the steamer travels at 5-6 m.p.h. Cincinnati artist and model builder Mr. John I. Fryant displays the Island Queen (1925-1947), scale 5/16 inch = 1 foot, with fellow artist Michael Blaser. As a child, Mr. Schiffer would regularly ride the Island Queen Steamboat, and often referred to it as the CONEY ISLAND BOAT, while the crew called her BIG LIZ.. Rated at 4,100 PAX the steamer used a 600 HP tandem-compound non-condensing engine made by the Charles Barnes Company, Cincinnati, Ohio, holder of patents for the steam-jet pump, vices, and more. The steamer blew-up and burned in 1947. GPS use 5670 Kellogg Ave.